Many years ago, we purchased a group of nine woodcuts depicting some of the stories told in Ovid's Metamorphoses and recently we added three more. On stylistic grounds, we assigned them to the period of c. 1490 to 1500 and, on the basis of their similarity to the woodcuts in the triumph of Venetian printing, Francesco Colonna's Hypnerotomachia. The Strife of Love in a Dream, we tentatively placed them in Venice. REcently, relaxing from updating our website, I glanced at Edith Wyss's The Myth of Apollo and Marsyas in the Art of the Italian Renaissance: An Inquiry into the Meaning of Images (Newark: University of Delaware Press, 1996), where, on p. 84, I came across a woodcut that was clearly very similar to ours. 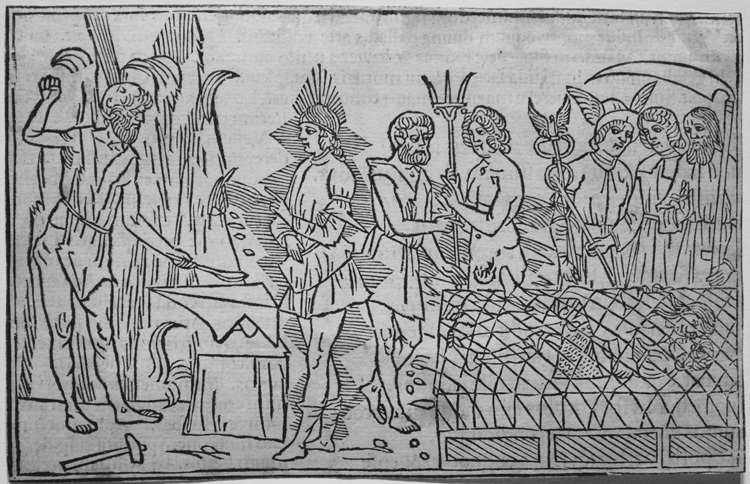 Lucantoniio Giunta, the publisher, took a a Tuscan paraphrase of Giovanne del Virgilio's 1377 allegorized prose narrative, added 52 woodcuts, and published the first Metamorphoses in Italian (by Giovanni Bonsignori), Ovidio metamorphoses vulgare in 1497 (reprinted in 1501). This is not a text of Ovid but a presentation of its allegorized meaning. Sadly, we do not have the whole presentation, but only the woodcuts (some of which are trimmed out of their context) as works of art that must stand alone. The designer of the woodcuts (at least two woodcutsboth of which we haveshow his monogram as "AI") chose not to present a single moment but to offer a sequences of incidents in one woodcut. 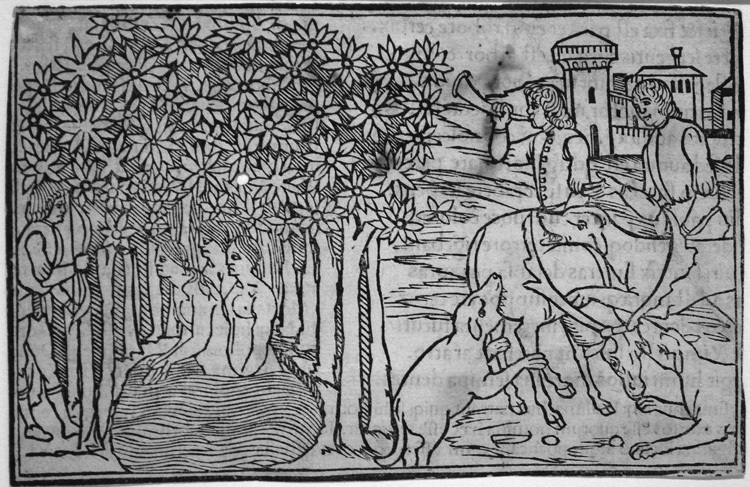 Happily, we discovered on the University of Virginia's website (at http://etext.virginia.edu/Latin/ovid/ovidillust.html#cycles) a complete set of the woodcuts with the full-page visible (though not the versos). 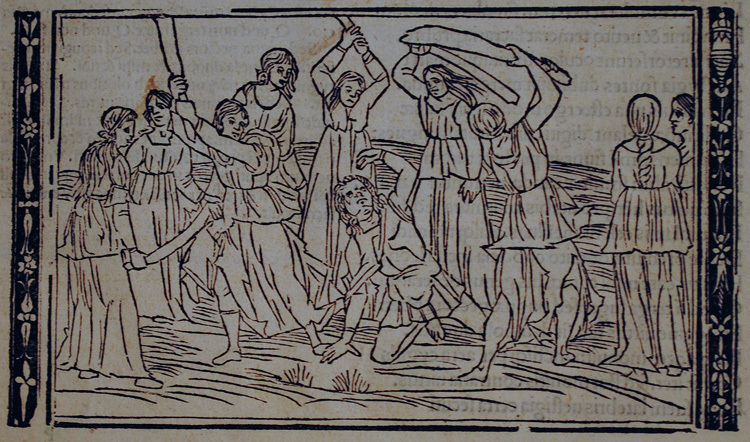 The woodcuts were evidently quite popular because they were used again in Latin editions of Ovid with commentary in Latin published in 1505 and 1509, where they show very little wear from our earlier impressions. 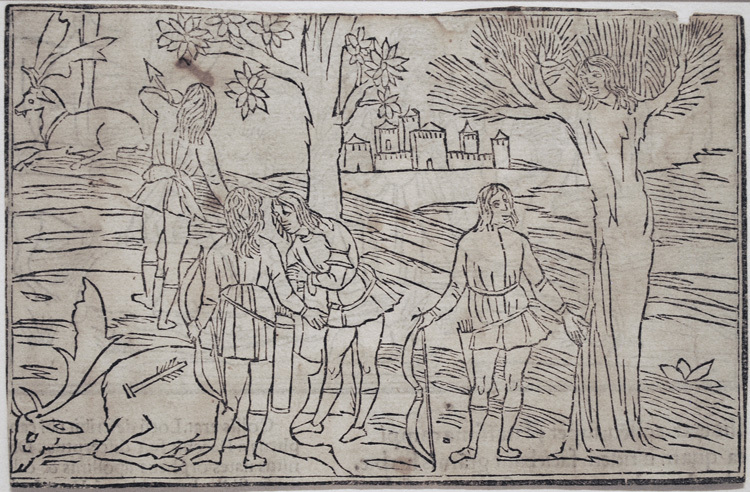 The woodcuts may have been based upon drawings made by Benedetto Montagna and may have been cut by Zoan Andrea il Veneziano and Nicolao da Modena. It is also possible that Mantegna's influence also may be included in their genealogy. Readers who prefer their Renaissance Ovids in English can enjoy the first complete translation into English by Arthur Golding (also a translator of Calvin and Luther), Ovid's Metamorphoses (1567), ed. John Frederick Nims (NY: Macmillan, 1965). Golding was in the employ of Sir Philip Sidney's uncle, the Earl of Leicester, and after Sidney's death he completed (or stole, according to Sidney's friend, Fulke Greville, later Lord Brooke), Sidney's translation of his friend Philip du Plessis de Mornay's A Woorke concerning the trewnesse of the Christian Religion (London, 1587). It is interesting to think about the mental flexibility of someone who could work on both Luther and Calvin, Ovid, and a French defense of the Christian religion, written by the future Henry IV's chief adviser and translated into English by the son of Queen Elizabeth's Lord Lieutenant of Ireland who was himself a courtier, a poet, a translator of the Psalms, a writer of sonnet sequences and a long prose fiction, and a general and governor of Flushing, given to the English by the rebellious Netherlandish rebels against Spain as security against a loan that Elizabeth made to them, a work that begins with general philosophical principles and moves to the revelation of the only truth in a Protestant understanding of Christianity. These images offer a kind of baseline. More medieval than Renaissance, they mark a moment when readers and viewers are just turning to works like Ovid's Metamorphoses not for allegorized readings of classical texts as illustrating Christian mysteries as in the Old French Ovide Moralizé (both the verse version done in the 13th century or the prose version from the 15th century) but out of a renewed interest in the old stories themselves which, by the last third of the 15th century have become the basis for paintings by artists like Botticelli, Giovanni Bellini, and Andrea Mantegna, and which in the works of 16th-century Venetian masters like Titian, Tintoretto, and Veronese become the subjects of beautiful, powerful, and moving works of art. Our images were published in Venice in 1497 (with a second edition in 1501) by an anonymous Venetian artist working for a humanest press in the last decade of the 15th century and the first decade of the 16th century. Two of the images are signed "IA" and the publication is a very early vernacular version for an educted and patrician audience. Venetian School, 1497. Apollo and Marsyas. 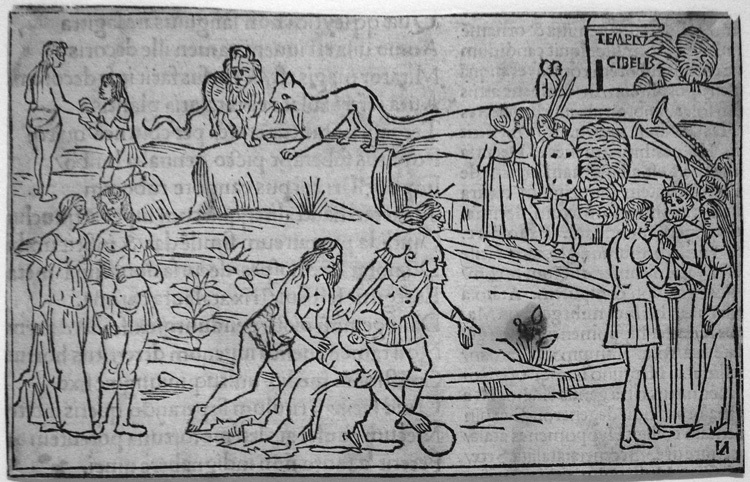 Original woodcut, 1497, 1501, Venice. In the center foreground, Marsyis challenges Phoebus Apollo (standing with his lyre next to Marsyas, his cheeks puffed up as e blows into a bagpipe, an instrument fit for shepherds, not gods) to a singing contest. Apollo is nbot amused. After the contest, Apollo orders that Marsyas be flayed, a process we see at right (and upper right we can see his flayed sing hanging on the ittle hill behind the scene). After his flaying he is transformed into a stream. Signed "ia' Lower left. Image size: 89x142mm. This image is reproduced in Edith Wyss, The Myth of Apollo and Marsyas in the Art of the Italian Renaissance: An Inquiry into the Meaning of Images (Newark: University of Delaware Press, 1996), p. 84 (for discussion, see pp. 83-85) . Price: $1250. Venetian School, 1497. Apollo and Phaeton. Original woodcut, 1497, 1501, Venice. In the left foreground, Phaeton kneels before his father Apollo and begs to be allowed to drive the chariot of the sun. In the top right, we see the fatal consequences of his inability to control them: to save heaven and earth from being consumed by fire as the horses fly close enough to set palaces and fields on fire, Jupiter has blasted Phaeton with a thunderbolt. In the middle background, Phaeton's sisters, rush forward in grief at the sight of their brother's fall from the heights (they will be transformed into Cypress trees by their grief). Image size: 89x142mm. Price: $1250. Venetian School, 1497. 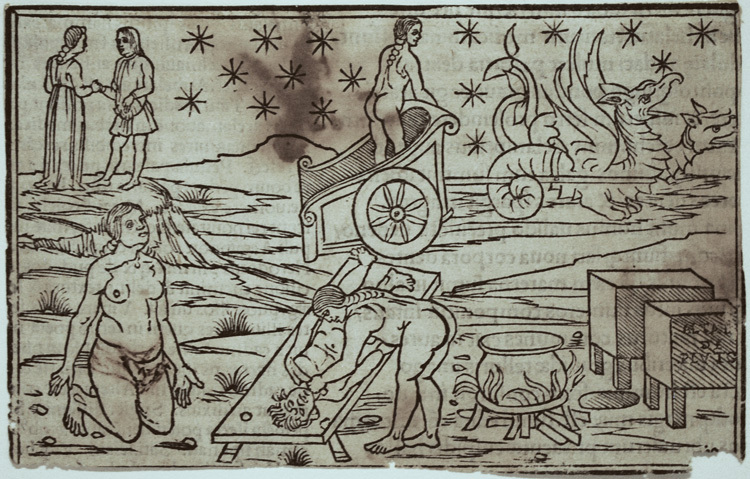 Callisto giving birth to Arcas. 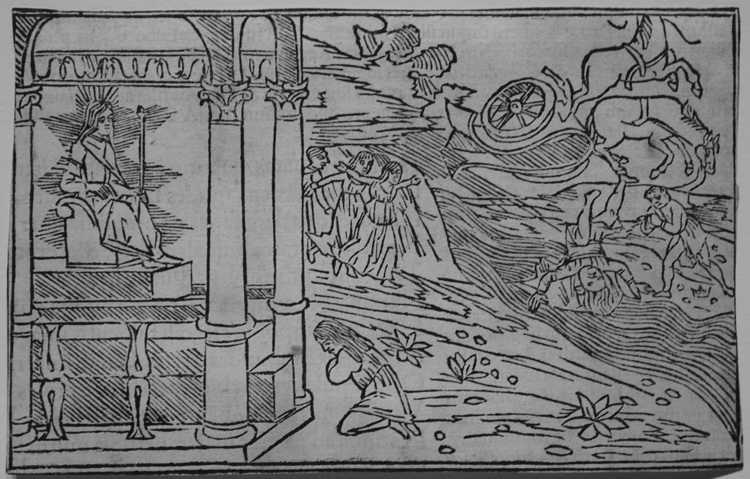 Original woodcut, 1497, 1501, Venice. In the left foreground, Zeus, disguised as the the goddess Diana, seduces the nypmph Callisto; lower right we see her giving birth to her son Arcas. In the central part of the image, Arcas, grown to adulthood, is attracting the attention of many of the nymphs and drawing the attention of the chaste goddess Diana, always a dangerous thing to do! She is about to transform him into a bear. 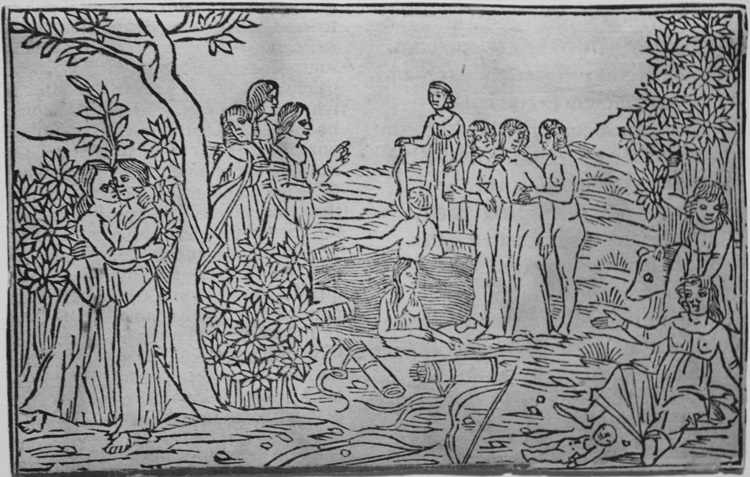 Callisto becomes pregnant and, her pregnancy discovered by being forced to bathe with Diana and the other nymphs, is exiled by Diana (center). Ultimately she and her son are stellified and become the constellations Ursa Major and Ursa Minor. Image size: 89x142mm. Price: $1250. Venetian School, 1497. Actaeon. Original woodcut, 1497, 1501, Venice. In the left foreground, Actaeon, a hunter (and this a devotee of Diana), comes upon Diana in her bathing in a pool with two maidens. She is about to sprinkle him with water which will change him onto a stag; at right, Actaeon in his stag form is hunted down and killed by his friends who can no longer recognize him in his stag form. Image size: 89x142mm. Price: $1250. Venetian School, 1497. Cyparissus. Original woodcut, 1497, 1501, Venice. Cyparrisus loves an enormous stag (left) but killls him by acident. He desires to mourn his friend forever and is transforemed into a cyprus by Apollo (at right). Image size: 89x142mm. Price: $1250. Venetian School, 1497. Mars and Venus ensnared by Vulcan. Original woodcut, 1497, 1501, Venice. At left Apollo tells him Vulcan that his wife Venus and Mars is making love. Vulcan makes a golden net (left foreground) and ensnares the lovers in the act. Behind the entrapped lovers in their bed, a group of gods gather to be amused (incluing Neptune, Apollo, and Chronos). This image is reproduced in Anne W. Lowenthal, Mars and Venus Surprised by Vulcan (Malibu: Getty Museum Studies on Art, 1995), p. 51. Image size: 89x142mm. Price: $1750. Venetian School, 1497. Hera revenges Jupiter's adultery with Alcmene by preventing the bnirth of Hercules. 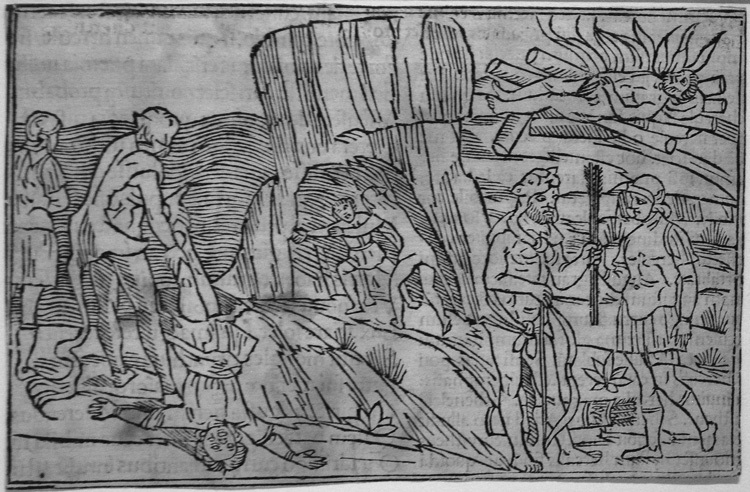 Original woodcut, 1497, 1501, Venice. 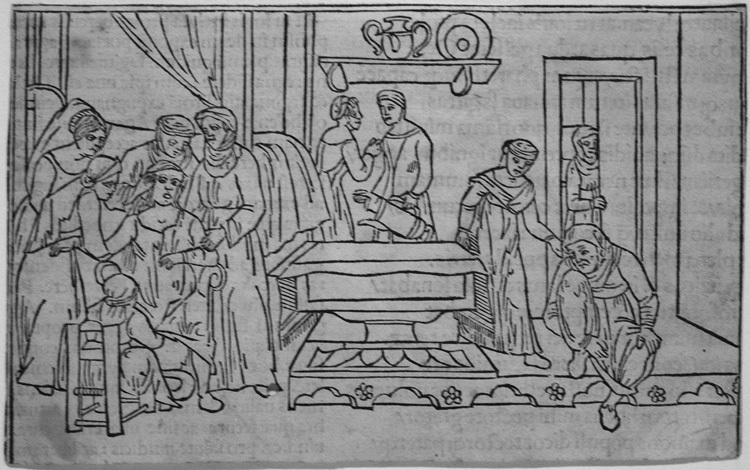 In the left foreground, Alcmene, surrounded by her ladies-in-waiting, sits on the birthing stool with the attending midwife; at right, an older woman (Hera in disguise) prevents the moment pf birth. Image size: 89x142mm. Price: $1250. Venetian School, 1497. Medea. 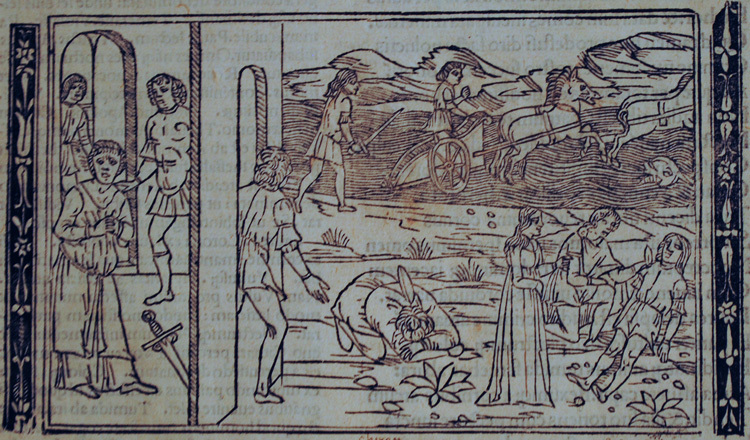 The woodcut shows the Medea praying to the gods and then reviving her father-in-law from death. Her husband then divorces her to marry someone else and she slaughters everyone involved before flying off in her chariot of dragons. The story comes from Ovid's Metamorphoses and the image comes from the first vernacular Ovid published in Italy. First printed in 1497 (second edition in 1501) with 52 woodcuts and commentaries aimed at a wealthy, educated audience. Original woodcut, 1497, 1501, Venice. Image size: 89x142mm. Price: $900. Venetian School, 1497. Atalante and Hippomanes. Original woodcut, 1497, 1501, Venice. This is a story told by Venus to Adonis warning him to avoiod lions and savage beasts "whom I despise altogether." Hippomanes sees Atalante, loves her, but she will only marry someone who can beat her in a race (and if they lose to her, they lose their life). Venus helps Hi[[omanes by giving him three golden apples and tells him to throw thm in front of her during their race, distracting her and allowing him to cross the finish line first. Unhappily, Hippomanes is so besotted with his new bride that he forgets to thank Venus. In response she moves inflames them with dessire and they make love in Cybele's temple (upper right) who is offended and transforms them into a pair of lions since they were beasts and defiled her temple. Signed "IA" lower right corner. Image size: 91x143mm. Price: $1250. Venetian School, 1497. Episodes in the Life of Hercules: Hercules rescues Alceste from Hell and kills the giant Anteus (who is revivified by contact with the earth) by preparing to lift him off the ground; Hercules on his funeral pyre (upper right); Hercules receiving his bow and arrows lower right. Original woodcut, 1497, 1501, Venice. In the left foreground, Phaedra, filled with guilt and despair, prepares to commit suicide. Upper right, Hippolytus drives the chariot of the sun while Theseus, Phaedra's husband and Hippolytus's father, chases after him with his sword in hand; bottom right we see Hippolytus lying dead upon the ground after he lost contro of the chariot and was blasted from the sky by Zeus' lightning. Image size: 89x142mm. Price: $1250. Venetian School, 1497. Phaedra and Hippolytus. Original woodcut, 1497, 1501, Venice. In the left foreground, Phaedra, filled with guilt and despair, prepares to commit suicide. Upper right, Hippolytus drives the chariot of the sun while Theseus, Phaedra's husband and Hippolytus's father, chases after him with his sword in hand; bottom right we see Hippolytus lying dead upon the ground after he lost control of the chariot and was wrecked upon the rocks in the seashore and drowned by the waves. We also see (at right) Esculapius bending over to heal him and, his name changed by the gods to Virbius, he lives a second life in obscurity. Image size: 89x142mm. Price: $1250. Venetian School, 1497. The Death of Orpheus. 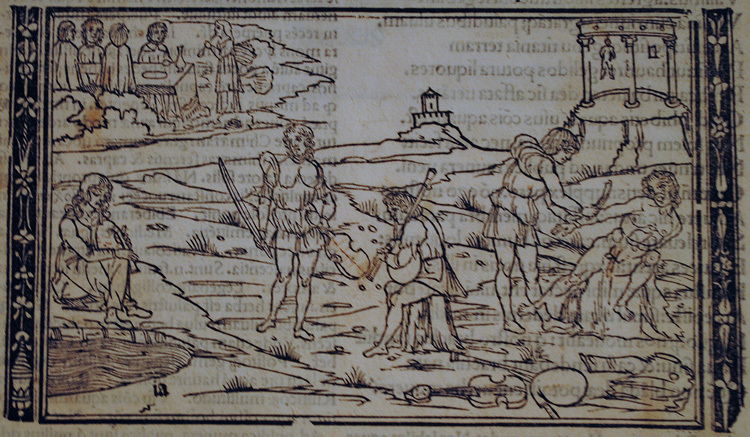 Original woodcut, 1497, 1501, Venice. After his failure to rescue Eurydice from Hades, Orpheus turns to singing the woes of love andd lovers' tragic ends. The women of the countryside become outraged with his rejection of love and kill him (thereby calling into question the effficacy of love poetry). Image size: 89x142mm. Price: $1500.